A battle has always raged in the otherwise quiet town of Storton between the local public school Stortfield Academy and the state school Stortvale High, from academic results to the Holy Grail of victory in the annual Rugby match, invariably won by Stortfield. But when both schools have their hearts and funds set on a new theatre, the dispute turns into a full-blown war between students, staff and headmasters. Who is in the gang of “Vigilantes” terrorising the streets at night? What is Stortfield School Governor Simon Petherton-Pugh up to- and what does it have to do with the drama teacher Viola McIntyre? Why are the Head Girls Melinda Farnsworth-Rogers and Belinda Bellingham-Steele sneaking around in the night? What does the mysterious Jack Wildblood want? Why does the bohemian artist Nigel Slot have a shed full of explosives? And can local reporter Jed Crane solve the mystery, and get the girl? In this gripping and hilarious tale of misadventure, Martin Dimery places a bomb under two schools and the education system. 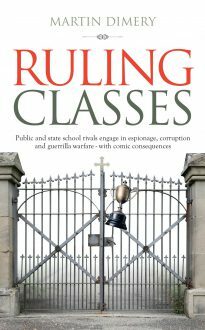 Ruling Classes is a darkly comic laugh out loud exploration of two schools going to war.